Business partners Tim Weiers, left, and Shane Rougemont are shown inside Red Mountain Autos, a new, used car dealership that’s opening this week in the same Silverthorne building where Hudson Auto Source used to be. Realizing that living in Summit County can be tough, the new owners of a used car dealership want to give the hardworking men and women who call this place home a little break. 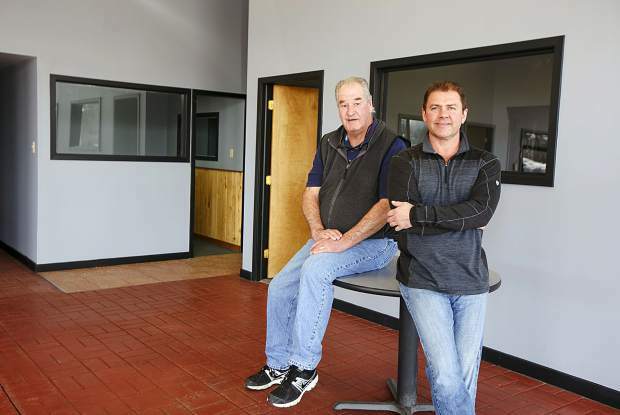 Red Mountain Autos has already logged its first sales, but the business will officially open its doors this week inside the same Silverthorne building where the Hudson Auto Source dealership once was. 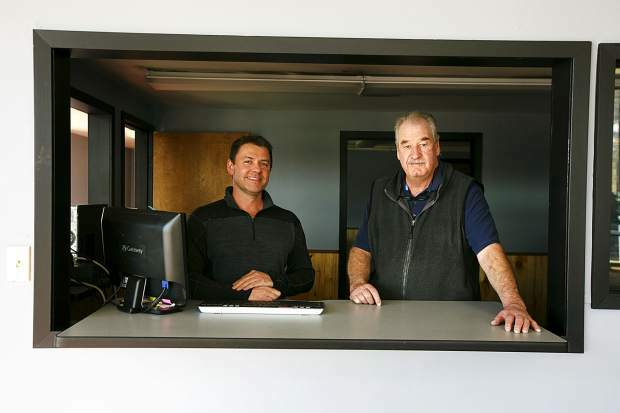 At 441 Blue River Parkway, the new, used car dealership and service shop is the product of Tim Weiers and Shane Rougemont — two business partners who between them have decades of experience in car sales, financing and the automobile industry. “Summit County needs a place where you can buy used cars at affordable prices instead of having to go to Denver,” Weiers said as he challenged the idea that people must travel to get the best deal on a used car. The inventory is only starting to amass outside the dealership, and the co-owners expect to have 25-30 cars on the lot in the coming weeks. Inside, they’ve spruced up the showroom with a fresh coat of paint, new carpet and other improvements designed to make for a more inviting atmosphere. Once stocked, Red Mountain Autos will carry all different sorts of makes and models of vehicles, including everything from cars in the $2,000 price range up to high-end SUVs like Cadillac Escalades and Range Rovers. If the dealership doesn’t have the ride someone’s looking for, Weiers said, they can find it. “We’re building the reputation,” Rougemont said of the new business, adding that he and Weiers are trying to put good, quality cars on the road by running them through the shop’s 130-point safety inspection. As a nod to the hardworking people of Summit County, Weiers also promised that Red Mountain Autos’ service shop will offer “super reasonable” rates on labor, along with oil changes starting at $34.95 for up to five quarts of conventional oil. They won’t make any money changing people’s oil at that price, he said, but it’s framed as the kind of business decision that could produce a steady stream of repeat customers. Weiers and Rougemont are also excited about working with members of the Spanish-speaking community, and they’re banking on their experience not only in the automobile industry, but across the Summit County area in general. With a lifetime of experience with cars, Rougemont previously worked at the Vista dealership in Silverthorne. Meanwhile, Weiers is the former general manager of the Hudson Auto Source dealership. Hudson was Summit County’s longest running dealership until the business closed in May 2018 when its owner announced a pending sale of the property. However, the would-be developer butted heads with the town over a lack of commercial space and the sale ultimately fell through, leaving a question about what would become of the prominent, downtown Silverthorne location. That question doesn’t necessarily have a long-term answer just yet, but the landowner did successfully lobby Silverthorne Town Council in February to adjust the necessary permits and allow a new body shop to open out of the old Hudson property while another sale of the property is pursued. In discussions with the town, the landowner described the move as “a bridge” to the eventual property sale, which is expected to take from two to four years. The body shop, J’s Body Shop, is already doing business on the Hudson property across the street from the Silverthorne Performing Arts Center. And like the body shop, the used car dealership will also have two to four years to work out of the building. After that, Red Mountain Autos will need to secure another location. Like many other local businesses, Red Mountain Autos is now hiring. Weiers said he expects to employ about 10 people when the dealership is fully staffed and they’re looking to fill a range of positions, including service technicians, sales people, general laborers and more. The dealership’s website, RedMountainAutos.com, is under development. People can find the dealership by searching Facebook for “Red Mountain Auto Brokers” or calling 970-368-6657.